Santiago -- On March 3, US Secretary of State Hillary Clinton arrived in Chile with an airplane full medicine, resources for a field hospital, first-aid food goods and professionals to deal with the innumerable medical emergencies the earthquake and tsunami left behind. But she also arrived with 25 satellite telephones, intended to assist in coordinating among the zones of the country that remain disconnected: no water, no electricity, no nothing. It is ironic that Hillary, as the Chileans are fond of calling the former U.S. presidential candidate, would give the first phone to Bachelet, who looked at it quizzically. There is a severe breakdown of communication in Chilean society, but it's not a problem that technology can fix. The Coalition of Parties for Democracy (Concertación de Partidos por la Democracia), which ends 20 years of governance on March 11, received a country profoundly divided by the bloody dictatorship of Augusto Pinochet. Democracy in the governments of Patricio Aylwin, Eduardo Frei, Ricardo Lagos and Michelle Bachelet pulled 30% of the population out of poverty. Another 20% of the population, however, remains mired in poverty. But the country thinks of itself differently, often being named among those nations "on the road to development". Malls are everywhere, and so are late-model cars, modern highways in Santiago, and resorts on the central coast. On television, models with silicone breasts sell the culture of consumerism, which is evident in all of Chile's major cities. But all it took was an earthquake to convince those who had been ignored by this system to abandon their ghettos in the suburbs, rush into the downtowns and to take for themselves whatever crossed their paths. A profound debate has burst onto the scene amid the tragedy of deaths and the missing, and amid the looting, and amid Chile's attempt to rebuild after the fifth-worst earthquake ever recorded. The question is, are the poor of Chile criminals? The TV news caught up with a women standing outside a supermarket while it was being looted. "Don't you need anything from inside there?" the reporter asked. "No," responded the woman. "If they give it to me, then, yes, but I am not a thief." In two of the 15 regions of the country officials have established curfews. Soldiers are in the streets - very much like life 20 years ago - trying to stop the looters and to allow people with homes, a job and bills to pay to sleep peacefully. 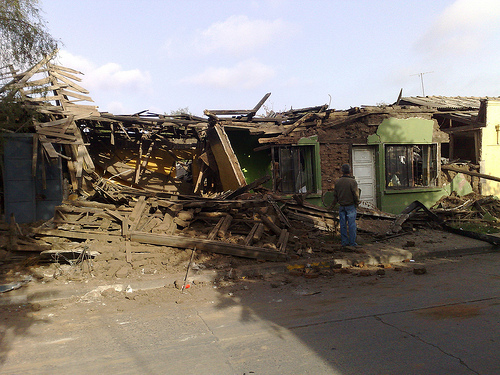 Without doubt, the tsunami scrubbed off the veneer and laid bare another side of Chile - one that is ugly and wounded. It revealed inequality.